Patti Payne and The Boys From Murray’s. One of the things that gave Montreal its old sparkle was the fact that you could get a drink there when the States was dry. Montreal was the largest wet city on the East Coast during Prohibition (1920 to 1933). In 1928, the Irving Berlin Co. published a song that summed up the feelings of parched Americanos in search of a good time. Ingersoll was the name of a line of inexpensive pocket watches which were known as highly reliable, even though they only cost a dollar. Phosphate drinks were sort of like the French “diabolo”, i.e. a flavoured syrup mixed with fizzy water, what today we would call a soft drink. Said Johnny Brown; I’m gonna leave this town, Ev’rything is closing down. And I’ll make whoop-whoop whoopee night and day. Yamo, yamo, I think I want a drink; Yamo, yamo, there’s water in the sink. But who the heck wants water when you’re dying for a drink? Was never meant to carry ginger ale. Are the gals up there okay? Won’t You Meet Me at Murray’s, written by Montreal pianist Willie Eckstein in 1929 in foxtrot rhythm. It sounds like a commercial for Murray’s but we don’t know if Murray’s paid for it. Murray’s was a popular chain of restaurants with Art Deco designs, now all gone. Every Murray’s restaurant was designed by C. Davis Goodman who also designed BENS, a classic streamline modern diner that was demolished in 2008 to be replaced by a tasteless boutique hotel. Where the middle name’s food. 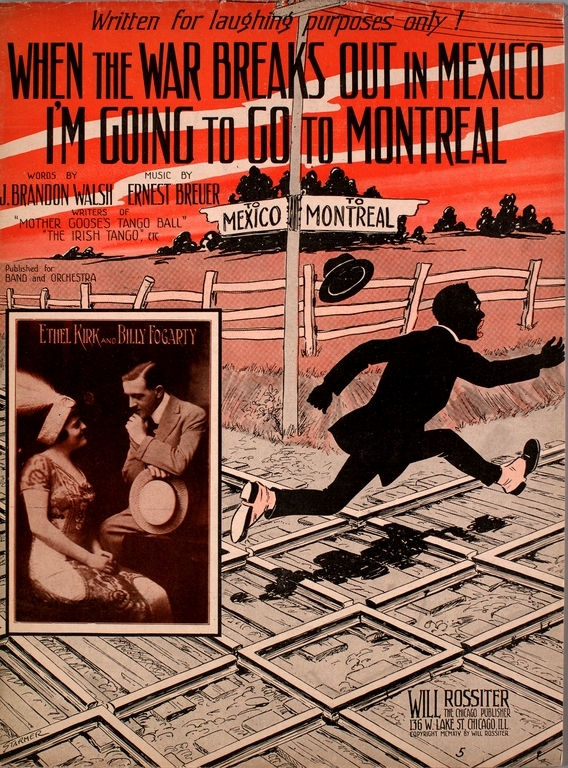 When the War Breaks out in Mexico I’m going to Go to Montreal, written in 1914, words by J. Brandon Walsh, music by Ernest Breuer. The United States intervened in the Mexican Civil War (1914-1915) decisively on the side of General Álvaro Obregón. Because of American forces, Mexican President Victoriano Heurta was forced to surrender. The anti-war lyrics were “written for laughing purposes only!” Draft dodging didn’t start with the Vietnam War. They said, your country needs you now, so grab your gun and go. They said, he was a hero, ain’t it too bad he’s dead. I couldn’t go to any war with just one pair of shoes. You’ll see me going mighty fast, but not to Mexico. I’d like to be a hero in a suit of blue but my insurance policy is overdue. Just break the news to father that I’m going to Montreal. 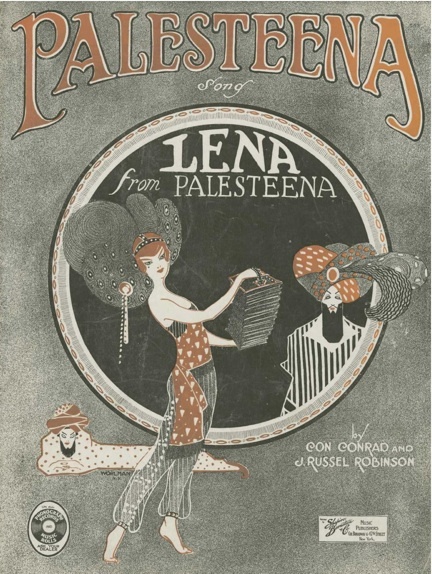 (Lena, Queen of) Palesteena, written in 1920 by J. Russel Robinson & Con Conrad, (Lena The Queen of) Palesteena serves as an example of the era’s fascination with Oriental/Asian exotic themes. In the 1920’s Manhattan’s show business fraternity began the exodus to Hollywood, seeking wider horizons on the silver screen. In 1926, Lena, the Yiddish Theatre’s “Queen of Palesteena,” suddenly packed her bags and moved from New York to Los Angeles. “How come you made such a sudden decision?” she was asked. “Two reasons,” explained Lena. “Nobody lives in New York anymore, and it’s too crowded.” The melody has a strong Klezmer influence. To go across the sea to entertain. From what they tell me, she don’t look the same. Who she thought was grand. ‘Cause she shakes a wicked concertina. There’s nothin’ sounds like it should. So rotten, it’s really good.